GORHAM, Maine — University of Southern Maine senior shortstop Sam Dexter picked up two more honors Monday when D3baseball.com announced its All-New England Region team and awards. For the second straight year, Dexter was selected the D3baseball.com New England Region Player of the Year and first team all-region shortstop. In addition to Dexter, USM sophomore first baseman Sam Stauble was named to the D3baseball.com all-region third team. Dexter batted .404 (72 for 178) this season with 53 runs scored, a single-season record-tying 23 doubles, three triples, five home runs, 44 RBIs and 19 stolen bases. He also had a .474 on-base percentage, a .652 slugging percentage and a sparkling .971 fielding percentage. Dexter led the Little East Conference in runs scored, hits and total bases, and is among the top 10 in doubles, triples and RBI. Dexter became the second player in NCAA Division III history to reach 300 career hits achieving that milestone against Framingham State University on May 1. Stauble made an immediate impact in the Huskies’ lineup after transferring to USM from the University of Maine batting a team and conference-high .428 with 35 runs scored, 10 doubles, 41 RBI and 15 stolen bases. 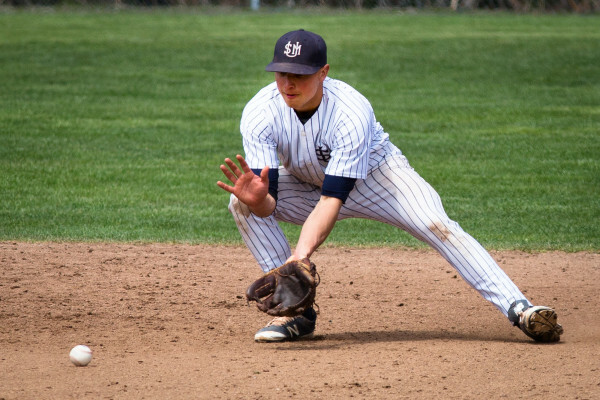 Dexter also was named to the New England Intercollegiate Baseball Association 30-man College Division roster for the New England All-Star game on Sunday, June 5, at Fitton Field on the campus of Holy Cross in Worcester, Massachusetts. Dexter will play for the Division III team that also includes Nic Lips of St. Joseph’s College. University of Maine women’s basketball standout Liz Wood has been named a finalist for the 2016 America East Woman of the Year award, the league announced Monday. Wood, who was recently named the Outstanding Graduating Student in the College of Natural Sciences, Forestry and Agriculture, graduated with a degree in biology, pre-med concentration, and a minor in chemistry. Wood was a three-time America East all-conference selection and finished her career with the Black Bears ranked sixth all-time in Maine history in scoring (1,462), sixth in rebounding (902) and eighth in assists (363). Her numerous academic and athletic awards include the America East Elite 18 Award, America East Female Scholar-Athlete of the Year, 2015 Dean Smith Award and a CoSIDA Academic All-American. The nominees will be narrowed down to three finalists, who will be announced via a release on the conference website on Monday, May 23. The winner then goes through a selection process to become a possible finalist for the NCAA Woman of the Year.